In feedback control, there is a constant flow of information in a closed loop. All of the instruments which work together in the loop to control a process are called the feedback control loop. Using the temperature example, the thermocouple output is picked up by the transmitter which sends a signal to the controller. Before the signal can be sent, the transmitter first transforms the sensed value into a signal which can be transforms this into a 4-20 milliampere electric signal which the controller can receive. 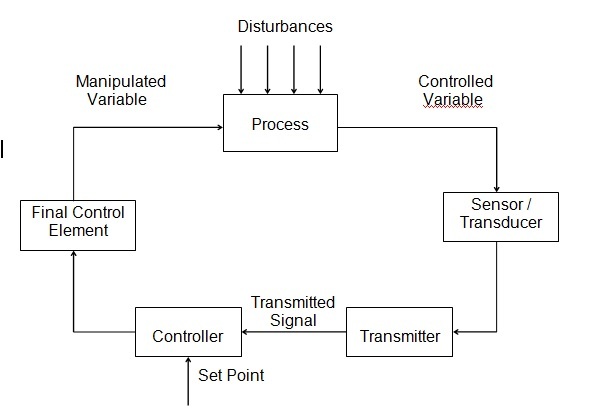 Determines needed action by comparing information received from the transmitter to the set point (the desired value of the controlled variable which is entered in the controller). If there is a difference between the set point and the actual value of the controlled variable (the deviation), the controller sends a signal to the final control element. For example, if the controller determines that the temperature in a vessel is too low. The controller sends a signal to the final control element to increase heat to the vessel. These are lights and displays which graphically show a value of the controlled variable so that operators and instrument technicians can see at a glance what is occurring in the process. Alarms tell the operators and instrument technicians when the value of the controlled variable is out of limits. They alert operators and technicians to problems or potential problems.